The Monk Gerasimos was a native of Lycia (Asia Minor). From his early years he was distinguished for his piety. Having then accepted monasticism, the monk withdrew into the depths of the Thebaid wilderness (in Egypt). Thereafter, in about the year 450, the monk arrived in Palestine and settled at the Jordan, where he founded a monastery. For a certain while Saint Gerasimos was tempted by the heresy of Eutykhios and Dioskoros, which acknowledged in Jesus Christ only the Divine nature, but not His human nature (i.e. the Monophysite heresy). The Monk Euthymios the Great (Comm. 20 January) helped him to return to the true faith. At the monastery the Monk Gerasimos established a strict monastic rule. He spent five days of the week in solitude, occupying himself with handicrafts and prayer. On these days the wilderness dwellers did not eat cooked food, nor even kindle a fire, but rather ate only dry bread, roots and water. On Saturday and Sunday all gathered at the monastery for Divine Liturgy and to commune the Holy Mysteries of Christ. In the afternoon, taking with them a supply of bread, tubers, water and an armload of date-palm branches for weaving into baskets, the wilderness dwellers returned to their own cells. Each had only old clothes and a mat, upon which he slept. In exiting their cells, the door was never secured, so that anyone coming by could enter, and rest, or take along necessities. The Monk Gerasimos himself attained an high level of asceticism. During Great Lent he ate nothing until the very day of the All-Radiant Resurrection of Christ, when he communed the Holy Mysteries. Going out into the wilderness for the whole of Great Lent, the Monk Gerasimos took along with him his beloved disciple Blessed Kyriakos (Comm. 29 September), whom the Monk Euthymios had sent off to him. At the time of the death of Saint Euthymios the Great, the Monk Gerasimos saw how Angels carried up the soul of the departed off to Heaven. Taking Kyriakos with him, the monk immediately set off to the monastery of Saint Euthymios and consigned his body to earth. The Monk Gerasimos himself died peacefully, wept over by brethren and disciples. 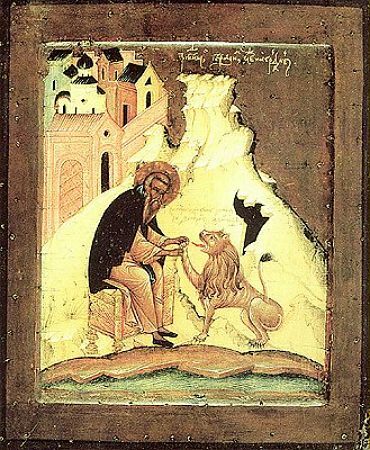 Before his death, a lion had aided the Monk Gerasimos in his tasks, and upon the death of the elder it too died at his grave and was buried nearby. And therefore the lion is depicted on icons of the saint, at his feet.